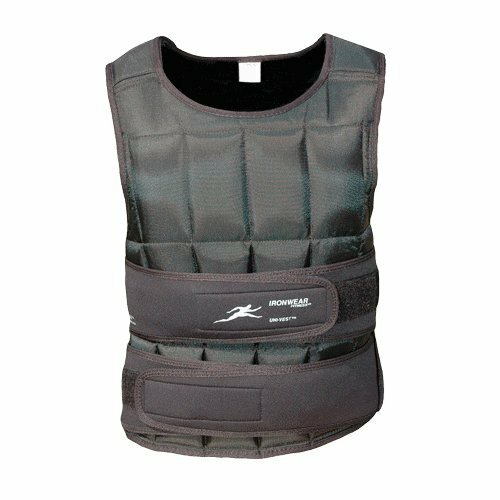 40 lb Uni-VestTM (long) Professional Weighted Vest Adjustable ½ lb Soft Flex-MetalTM Weights Brand New From Factory Immediate Shipping Suggested Retail Value $261.99 (if purchased separately) (20 lb. Uni-Vest plus four 5 pound additional weight kits) Uni-VestTM is the world's leading fitness, weight loss, and sport performance weight vest. Uni-VestTM from IRONWEAR TM is the only weight vest line to be endorsed by ReebokTMand sold by ReebokTM. It is used by more athletes and trainers around the world than all the other weight vests combined. Uni-VestTM(long) sleek patented compact design is the world's best and most popular weighted vest. The basic short Uni-VestTM is adjustable from 1 to 20 pounds. Individual ½ pound patented Soft Flex-MetalTM Weights fit into unique stretch pockets which hold the weight securely on all sides. The soft rubber weights are evenly distributed over the vest and bend with your body. Uni-VestTM(long) fits tighter and provides more comfort that any other vest. The Soft Flex-MetalTM Weights conform to the shape of your body and become one with your body. In case of a fall the weights protect against the impact. Uni-VestTM(long) is in a league of its own. The proprietary oversized overlapping elastic strapping system holds the vest securely to almost any size torso while allowing for expansion and contraction of the chest during rigorous exercise. Uni-VestTM(long) has a heavy padded ballistic Nylon shell for maximum durability and soft fabric covered double stitched edges for comfort. The shoulder straps are strong and flexible to allow for a full range of motion. Uni-VestTM(long) can be expanded up to 77 pounds with the purchase of an Under VestTM which adds additional pockets for more weight inserts.